Dupuytren’s contracture is named after Guillaume Dupuytren, a French surgeon who lived in the 1800s. In Dupuytren’s, the normally thin, flexible fascial tissues within the palm of the hand becomes thick and stiff with tough scar tissue. Cord-like thickenings can arise in the palm and fingers. This process can cause the fingers to gradually “draw up” or bend into the palm, making it difficult to straighten the fingers (See image). Over time, contractures within the joints can develop making it difficult or impossible to fully straighten the finger. This is called a “flexion contracture”. Dupuytren’s is most commonly seen in males over the age of 40 or 50. Related processes can involve the soles of the feet (Ledderhose’s disease) and male genitalia (Peyronie’s disease). The cause of Dupuytren’s is not fully understood, but there is a well-recognized genetic (hereditary) contribution. Often people of Northern European or Scandinavian ancestry are at risk – for this reason it has been called “Viking’s disease.” It is rare in people of African and Asian descent. It has not been proven to be related to trauma. It may be related to diabetes, heavy smoking, and alcohol abuse. What are the symptoms of Dupuytren’s? Dupuytren’s disease is typically a slow-developing process. People notice a thickened lump or “nodule” in the palm which can develop into a firm band or “cord” extending to the finger, most commonly the ring and small fingers. Occasionally, gripping with the hand can be painful at the site of the nodule, but most people with Dupuytrens are pain-free. The condition can affect either hand. Some patients with contractures report difficulty putting on a glove, reaching into their pocket, or shaking hands. What are the Dupuytren’s treatment options? Unfortunately, there is no “cure” for Dupuytren’s. Treatment is aimed at correcting the finger contractures and improving hand function. This can be accomplished with a variety of methods. Treatment does not always completely correct the contractures, and the contractures can come back over time. The goal is to improve hand function while minimizing complication risks. Many people with Dupuytren’s have a mild form of the disease and they may not develop severe contractures in their hands. For these patients, education and observation is all that is required. Re-evaluation should be considered when you can no longer place the hand flat on a table (tabletop test) or when your lifestyle is affected. Tender Dupuytren’s nodules in the palm can be injected with corticosteroid (Kenalog) medication to soften the nodules and make them less tender. Some nodules can shrink in size with this technique, but the nodules may grow back over time. Radiation treatment is controversial. This is more popular in Europe. Some radiation oncologists treat patients with early Dupuytren’s disease in the hopes of slowing down the disease progression, however there are potential risks with this treatment. In more moderate or severe cases, flexion contractures can interfere with hand function. If quality of life is affected, further treatment may be recommended. There are numerous procedures which have been described to treat Dupuytren’s contractures. Three popular procedures are described below, and will be chosen based on the patient’s condition and medical history. Each procedure has pros and cons. No procedure has been proven to be the best for all patients. 1. Needle aponeurotomy (NA) is a minimally-invasive procedure performed under local anesthesia in the office. This procedure is also referred to as “percutaneous fasciotomy” by some surgeons. 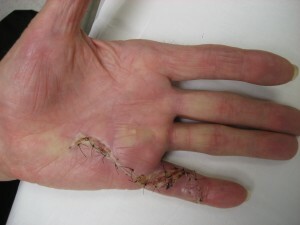 Using the tip of a needle, the tight cords in the palm are perforated multiple times. Then the fingers are manipulated to rupture the cords, allowing the fingers to straighten. This procedure is performed in the office but it is still considered a type of “surgery” and it has some risks. Skin tears, skin irritation, pain, bruising, and swelling at the needle site are common. These symptoms usually resolve and heal in a few days. More severe complications such as infections, injuries to the nerves and flexor tendons are rare. This procedure was developed in France in the 1980s and has gained popularity in the United States recently. Not everyone is a candidate for this procedure. This is the least expensive treatment intervention for Dupuytren’s and the procedure has minimal downtime. Recurrence rates are high, but the procedure can be repeated in the future for recurrent contractures. 2. Collagenase injections (Xiaflex) were FDA approved for use in the United States in 2010. This minimally-invasive procedure involves an injection of an enzyme to dissolve the cords of fascia collagen. The injection is performed in the clinic and it is followed by manipulation of the fingers to rupture the cords about 2-3 days later using local anesthesia. This allows the fingers to straighten. Similar to NA, collagenase injections are not risk-free. Bruising, pain, itching, and swelling of the hand and lymph nodes is common. Blisters or skin tears can also occur, but these usually heal on their own in a few days. Ruptures of the flexor tendons of the finger are rare (less than 1% of patients), but if this happens, it is a significant complication. Allergic reactions to the medication are also possible. Xiaflex collagenase medication is expensive, but it is often covered by many insurance plans. Not all patient are good candidates for this procedure. Recurrence rates are high but the procedure can be repeated in the future for recurrent contractures. 3. Fasciectomy surgery is an outpatient procedure performed in the operating room involving incisions on the palm-side of the hand and/or fingers to remove selected portions of diseased tissues. This technique is commonly performed for Dupuytren’s disease today. During the surgery, the contracted fascia is removed while the nerves and blood vessels are protected. Occasionally, a small skin graft is used to replace an area of diseased skin. Bleeding, infection, wound healing problems, swelling, and nerve/blood vessel injury are possible risks with any surgery, including Dupuytren’s fasciectomy surgery. The results from surgery are usually longer lasting than the results from NA or Xiaflex. Many patients have results which last a lifetime. After the needle (NA) or collagenase injection procedures, patients are encouraged to gently work on finger range of motion (bending and straightening the fingers) guided by therapy. These exercises are performed several times a day at home/work. Use of the hand is allowed as pain tolerates, avoiding heavy lifting for one week. The swelling and tenderness from the procedure gradually improve over a few days. The recovery is more rapid with NA or Xiaflex collagenase procedures, compared to surgery. After the fasciectomy surgery, the hand is protected in a plaster splint for the first few days. The splint is removed in clinic and hand therapy is begun. Hand therapy is very important in the recovery. This involves finger range of motion exercises, use of a splint, and daily wound care. The palm wounds typically heal within 3 weeks with this technique. A removable splint is worn at night for a few months to help prevent early recurrence. Gradual return to activities over 4-6 weeks is expected as the pain and swelling from surgery improve. The procedures performed for Dupuytren’s contractures improve finger range of motion and hand function for many years for most patients. Patients with moderate to severe contractures of the proximal interphalangeal (PIP) joints are harder to correct. Over time, many patients develop some level of recurrence of the joint contracture. In other words, the Dupuytren’s contracture can come back. Most studies report lower recurrence rates with surgery than the minimally-invasive techniques such as Xiaflex and NA. Video provided by the American Society for Surgery of the Hand. The photos are copyright Dr. John Erickson.